The strawberry is a widely grown hybrid species of the genus Fragaria. It is cultivated worldwide for its fruit. The fruit is widely appreciated for its characteristic aroma, bright red color, juicy texture, and sweetness. It is consumed in large quantities, either fresh or in such prepared foods as preserves, fruit juice, pies, ice creams, milkshakes, and chocolates. Artificial strawberry aroma is also widely used in many industrial food products. Strawberries contain approximately 33 kilocalories, is an excellent source of vitamin C, a good source of manganese, and provides several other vitamins and dietary minerals in lesser amounts. 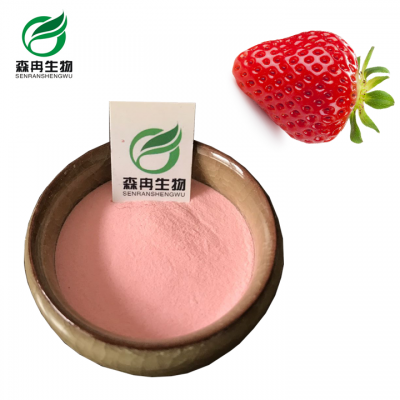 Strawberry powder is rich in abundant Carotene and Vitamin A, night blindness can be alleviated, with the maintenance of epithelial health, eyesight Liver, and promote the effectiveness of growth and development. Strawberry powder is rich in dietary fiber, which can promote gastrointestinal motility, gastrointestinal tract to promote food digestion, improve acne, intestinal cancer. And promote stomach to wriggle. 1. Baking: Such as bread, pizza, desserts, donuts, spices, pie, jelly, and recipes. 2. Beverage: Such as ice cream, fruit juice, smoothies, yogurt etc. 3. Direct drink:10 grams of Strawberry powder dissolved directly in 250ml water. Enjoy the delicious Strawberry juice powder. Latin Name Fragaria × ananassa Duch.